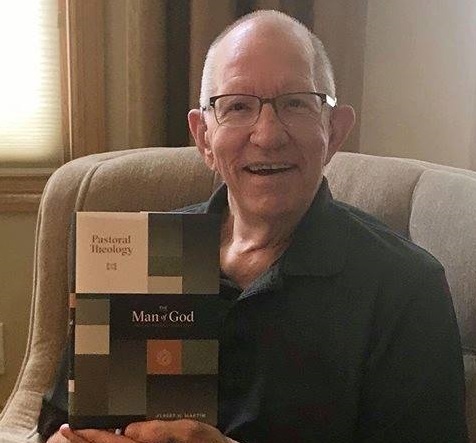 Image: Al Martin with his new book on Pastoral Theology. I have uploaded WM 104: D. Scott Meadows on Al Martin's Pastoral Theology. Pastor Meadows and I both were speaking last week at the 1689 Conference in Indianapolis. I was able to get in a short interview with him last Friday evening (9.14.18). In the interview Pastor Meadows discusses his call to the ministry and his 27 years of pastoral service at Calvary Baptist Church (Reformed) in Exeter, New Hampshire. He also shares about his labors in editing the writings of influential RB pastor Albert N. Martin. Scott shares, in particular, about a new book by Al Martin titled Pastoral Theology: The Man of God: His Calling and Godly Life (Trinity Pulpit Press, 2018) (the first in a projected three volume series). We end the talk with a brief conversation on the beauty of the King James Version as an English Bible translation. This was a great interview - thanks for making it. Though not in ministry myself I am very interested in reading the first volume of the book discussed.